The major averages may have finished the week and month with a whimper, but each booked strong gains for the third quarter of 2018. Over the past three months, we’ve seen the major benchmarks clamber back to new all-time highs, as investors focused on solid domestic economic health, while shaking off trade tariff tensions. During that time the S&P has risen more than +7%, which is its biggest quarterly advance since the fourth quarter of 2013, while the Dow gained about +9%. Both indexes have now risen 11 of their past 12 quarters. The Nasdaq is also up more than +7% over the quarter, and made its ninth straight quarterly gain. On the month, the Dow gained +1.9%, as the S&P 500 added +0.4%, while the Nasdaq actually edged down –0.8%. Recent sessions have been relatively quiet as the trading range has been rather tight. The benchmark S&P has not closed with a move of even 0.5% in either direction any day this week. On the week, the Dow lost -1.1%, S&P 500 gave up -0.5%, while the Nasdaq gained +0.7. This recent advance in the market is much broader than one might have anticipated in a late-stage expansion. The market closed out the quarter against a comfortably bullish technical backdrop. 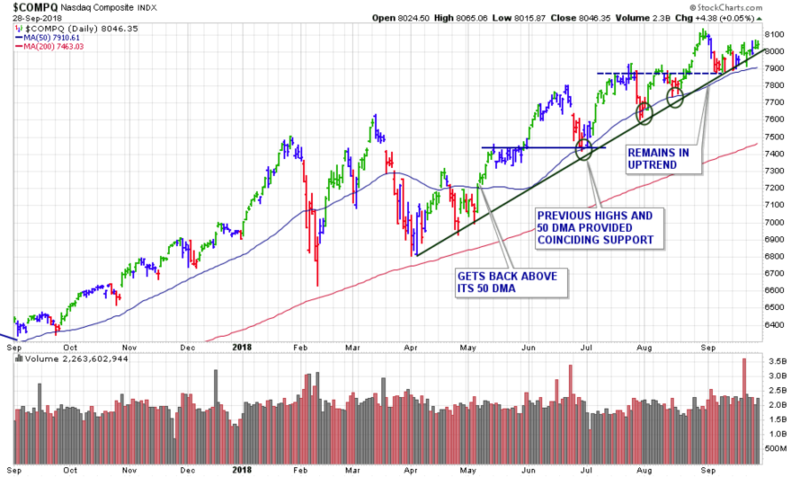 The recently lagging Nasdaq Composite is now nearing another possible breakout — challenging its range top (8,042) — while the S&P 500 and Dow industrials continue to digest previously decisive breaks to record territory. Issues surrounding trade policy continued to linger as the trade dispute between the U.S and China grew more heated with the recent imposition of another 25% tariff on more than $200 million of Chinese imports to the U.S. While investors have repeatedly shrugged off trade worries, focusing instead of strong economic data and corporate earnings, any additional developments on this front could dictate short-term market direction. Another geopolitical event may take center stage in coming days as Italy’s anti-establishment government significantly widened its budget-deficit target for next year to fund its electoral promises. This is a move that will likely put it on collision course with the European Union. The issue is the latest bit of geopolitical turbulence that could impact Wall Street, following the currency crisis in Turkey earlier this summer. Here at home, the Fed raised its GDP growth forecasts for 2018 and 2019, and dropped the phrase that its policy remains “accommodative.” However, the removal of the word should be taken as an indication that the economy is performing as expected, emphasized Fed Chairman Jerome Powell during a news conference following the Fed’s announcement. We had 1 breakout from last week’s watch list this past week. Please find my updated commentary on this selection below. I ran my regular stock screens and added 6 new stocks to our watch list this week.